Move over, mashed potatoes. Make room on your holiday table for these healthy and delicious vegetable side dishes. “Pass the spinach” — said no one ever at a holiday dinner. The last thing anyone wants to do at a celebratory meal is worry about getting their daily serving of vegetables. But veggies are a versatile and often overlooked base to a variety of scrumptious side dishes. Think about it: you’ve already got mashed potatoes and green beans on the table, why not shake things up a bit with some unique veggie-forward sides? Plus, for any vegetarian or vegan family or friends, these tasty sides can be combined to make one tasty meal (so you don't have to worry about making another main course). Even the carnivores may have more produce on their plate than anything else with these mouth-watering recipes. Who knows, your guests may even be asking you to pass the veggies this year! This medley of cumin roasted delicata, acorn and butternut squash topped with a lemon tahini dressing adds some Middle Eastern flair to your holiday table. As if those flavor combinations aren’t enough to make your stomach rumble, the whole-wheat couscous and pomegranate arils give this side a nice crunchy texture. Keeping with the squash theme — it is in season after all — this stuffed acorn squash could stand alone as a delectable vegetarian main. It’s bursting with the flavors of fresh herbs, like thyme and rosemary, which contrasts nicely with the sweet squash and cranberries. The farro provides a nutty taste, and the Parmesan cheese adds a savory saltiness, all of which come together for a complex and delicious dish. Don’t be fooled by the look and taste of this creamy risotto (although your guests will be) — it’s basically just fruits and veggies. The velvety texture comes from a mixture of pumpkin, vegetable stock and Parmesan cheese, while the cauliflower serves as the “rice.” Put this out on your holiday table and see if anyone notices that it’s not real rice. Believe it or not, sweet potato casserole doesn’t always have marshmallows on top. As a matter of fact, it tastes better when it’s free from the gooey camp fire treat. This healthier version of the traditional holiday casserole makes the sweet tubers the star — what a concept! 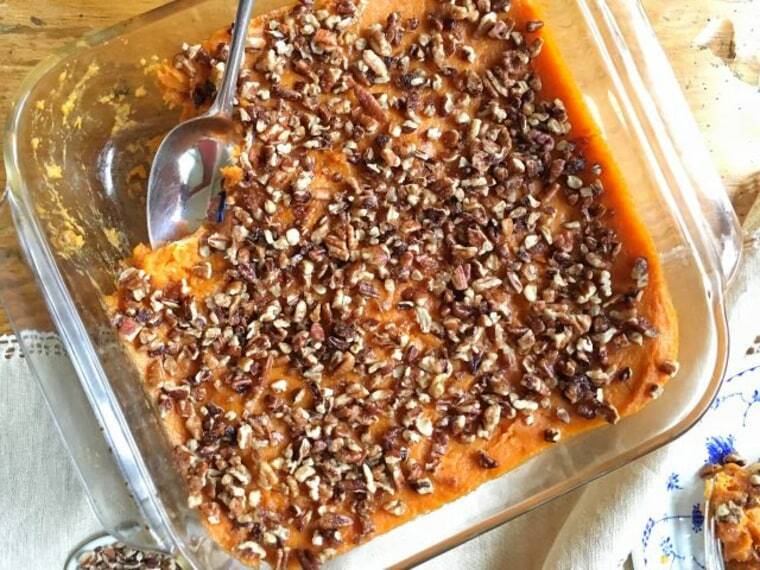 It mixes mashed sweet potatoes with a little bit of orange juice, coconut oil and a dash of brown sugar. In other words, it lets the already sweet root veggie shine. The word "salad" may conjure up thoughts of boring lettuce topped with a sad dressing, but this version will make you rethink that idea. Start by roasting cranberries and whipping up a batch of wild rice. Throw the ingredients together with kale and a Maple-Apple dressing, and you’ve got the most exciting fall salad at your holiday shindig. When did green beans become synonymous with creamy mushroom soup and canned fried onions? It’s time to break out of the green bean casserole mold with this vegan dish. Not only do the caramelized onions deliver big flavor without big calories, the roasted nuts add a nice texture to the simple dish. I would wager a bet that you’ll be hard pressed to find someone who doesn’t like bourbon, brown sugar and bacon. Pair those three ingredients with crispy Brussels sprouts, and you’ve got the ultimate crowd pleaser. Let’s just call this the gateway dish for the non-veggie lovers. After a few bites of this, you may find them asking you to pass the salad. Add a bit of royal purple to your holiday table with this seven-ingredient roasted beet salad. This can be eaten hot or cold, so feel free to make this dish ahead of time to cut down on the time you spend in the kitchen. Think outside the side dish box and give shishito peppers a try. These small green peppers are a sweet and fun finger food, and they require practically no time or fancy ingredients to make them taste good. Plus, they come with an inherently fun game — every 1 in 10 peppers is spicy, so it’s like playing pepper roulette! Although you may not typically start your holiday dinner with a soup course, this gorgeous carrot ginger version may make it a new tradition. Soup is so easy to make ahead of time, and this creamy version includes split green peas, which adds a protein and fiber punch.